The winner of the Jazz Young Musician Award 2018 was awarded to James Davison (trumpet). 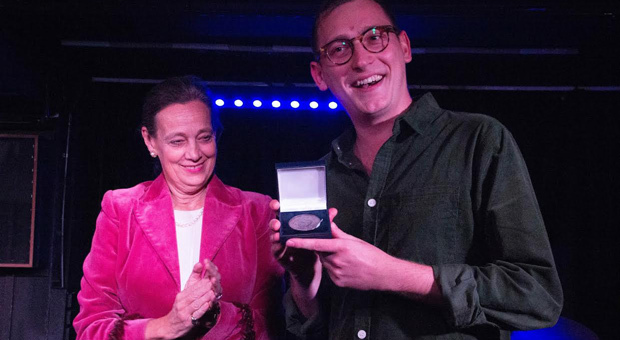 The Master of The Musicians’ Company, Lady Brewer, presented James with his award at the Pizza Express Jazz Club on 30 September. The finalists who played in the competition were: Nathaniel Cross (trombone), James Davison (trumpet), Joe Downard (bass), Will Glaser (drums), Alex Hitchcock (saxophone) and David Swan (piano). The award was announced following a close audience vote. James Davison joins a distinguished list of past winners including singer Tina May, saxophonists Andy Panayi and Tim Garland, and singer and BBC Radio 3 presenter Emma Smith. Winner of the Smith-Watkins Trumpet Award (2016), at the Royal Academy of Music, James is now pursuing a busy and varied freelance career based in London. He was lead trumpet in the National Youth Jazz Orchestra (2014-2017) and is currently lead trumpet with the Scottish National Jazz Orchestra and second trumpet in the London Jazz Orchestra. He has performed with the BBC Big Band, The Syd Lawrence Orchestra, Pete Long’s Echoes of Ellington Orchestra and the Ronnie Scott’s Jazz Orchestra. Since graduating with a MA in Jazz Performance at the Royal Academy of Music, James has become a regular lead trumpet deputy in West End Shows including Aladdin, 42nd Street, Book of Mormon, Beautiful, An American in Paris and Guys and Dolls. He has performed with the London Symphony Orchestra and as guest Principal with the Royal Philharmonic Orchestra and the Hallé Orchestra. James is also a member of the award winning Misha Mullov-Abbado Group, Jonny Mansfield’s Elftet, the Sam Watts band, Joe Hill’s North Ark, as well as his own band co-led with Callum Au, playing the music of Clark Terry and Bob Brookmeyer. Each year The Musicians’ Company, one of the oldest and most respected charitable companies in the City of London, donates over £250,000 in scholarships and awards in support of young musicians at the start of their careers across many musical genres. For over 500 years the Worshipful Company of Musicians has supported the music profession in all its forms. Every year the Company gives a range of awards, scholarships and medals, which make a real difference to the lives of outstanding young singers, composers and instrumentalists as they make the transition from study to a professional career in music. The John Christie Award is the Company’s most renowned award with a distinguished list of past winners. Other awards range from Classical Music to Jazz, Music Theatre, Popular Music, Brass Bands and the Military Schools of Music. In addition to their specific award, our winners are invited to become Yeomen Young Artists for the next five years. This entitles them to be considered for a range of performance opportunities, which the Company arranges – probably their top priority as they seek to become known. This year our Yeomen Young Artists will give over 75 performances at venues ranging from the Wigmore Hall, where the Company organises its own concerts every year, to major music festivals across the country. Our Yeomen Young Artists also take part in an extensive Outreach Programme, taking music into primary schools mainly in the more deprived inner London boroughs that have little or no music provision. During 2018 we have worked with 40 different maintained schools. This has involved 17 volunteers making a total of 120 school visits and working with almost 7,000 children. If you would like to learn more about the Company, join us at our events or support our Yeomen Young Artists, please visit our website, www.wcom.org.uk or contact Hugh Lloyd, at clerk@wcom.org.uk.